IWICS - SCI Technology, Inc.
For reliable communications within applications that do not require secure capabilities, SCI Technology offers the Integrated Wireless Intercommunications System (IWICS). Designed to operate flawlessly in the harshest environments, IWICS provides warfighters with the mobile autonomy they need to compete their air- or land-based missions. Like all of our intercommunications systems, IWICS is fully compatible with FireComm® and TOCNET®, and can integrate with any existing intercommunications system for maximum flexibility (including ICS systems like Andrea, Palomar, Orbit, Esterline, Becker, Cobham, Telephonics, VIC3/5 and others). SCI’s wireless intercommunications solutions grant operators complete freedom of movement in and around the platform via our Wireless Base Station (WBS) and Wireless Transceiver (WT). 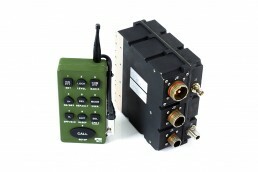 The WBS connects through a variety of system interfaces (1394b, analog audio or Ethernet) to support quick and easy integration, and the WT extends the warfighter’s communications link up to 3,700 feet (1 km) from the platform. Working in unison, the various parts of the this system provide superior audio quality for all radios and peer-to-peer intercommunications within the platform environment.